Sciency Thoughts: Aurelia sp. : Over 800 bathers stung by Moon Jellyfish on central Florida coast in three days. Aurelia sp. : Over 800 bathers stung by Moon Jellyfish on central Florida coast in three days. A bloom of Moon Jellyfish, Aurelia sp., on the central Florida coast has caused problems for bathers this week, with over 800 people stung in a three day period from Saturday 9 to Monday 11 June 2018. 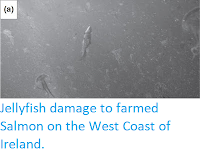 The problem first came to the attention of coast guards on Saturday 9 June, when 107 people reported being stung. This number rose sharply the following day, when 523 people were stung, with a further 180 people stung on Monday 11, bringing the total to 810. 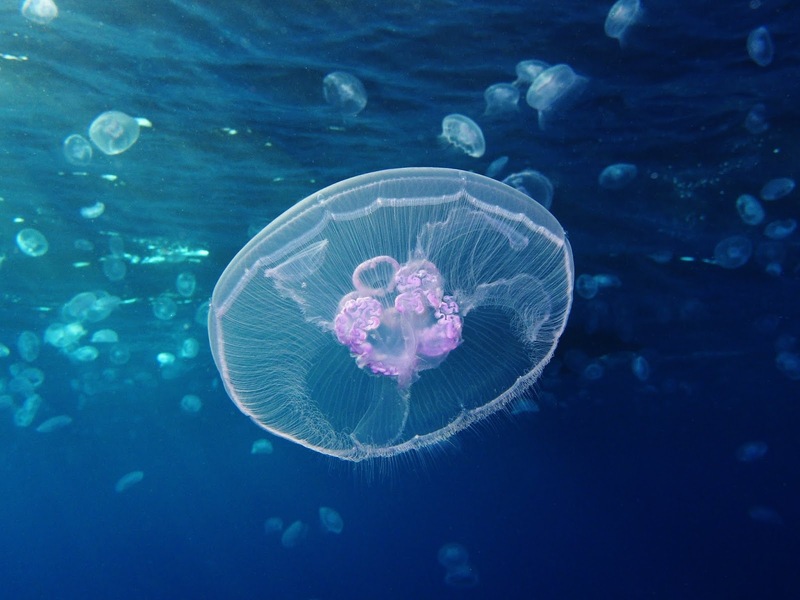 Fatalities from Moon Jellyfish are extremely rare, but the stings are painful and unpleasant, and can cause distress to those who suffer them. A Moon Jellyfish, Aurelia sp.. Key West Aquarium. 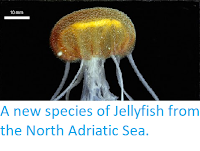 Members of the genus Aurelia are inshore Jellyfish found in coastal waters in tropical, subtropical and temperate seas around the world. 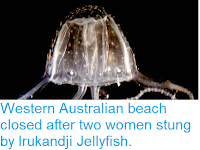 They are large Jellyfish, reaching a maximum size of about 40 cm in diameter, a slight purplish tinge and four large, horseshoe-shaped gonads. 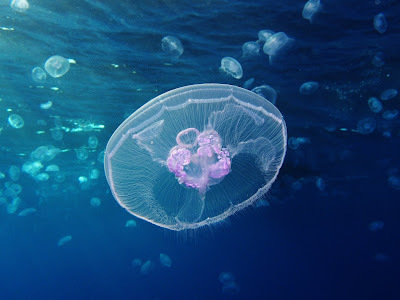 Moon Jellyfish often undergo major blooms in the summer months, due to their tolerance for low oxygen conditions, which are harmful to most of their competitors and predators (Fish and large invertebrates), enabling them to dominate environments where these animals are excluded. This tends to lead to summer blooms in enclosed areas (heat and lack of exchange with the open ocean can rapidly deplete oxygen levels), which can be worse in areas where pollution from agriculture or other Human activities leads to eutrophication (excess nutrients which can lead to eutrophication and the rapid growth of blooms of Algae, Bacteria or other micro-organisms, which absorb oxygen from the water leading Fish and other aquatic organisms to asphyxiate). Flooding kills at least five in Kumasi, Ghana. Landslide kills four in Arunachal Pradesh. Hottest full day on Earth ever recorded in Oman. Asteroid 2017 YE5 passes the Earth. Seven dead in Mexico flooding. Suspected Foot-and-Mouth outbreak in Botswana. Asteroid 2018 LD1 passes the Earth. Landslide kills three in Zhob District, Pakistan. Flooding kills 23 in northeastern India. Landslide kills five in Mandalay Region of Burma. Eruption on Mount Kerinci, Sumatra. Asteroid 2015 DP155 passes the Earth. 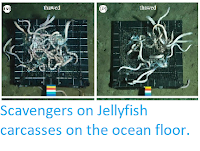 Chinese city hit by rain of sea creatures. Asteroid 2004 LB passes the Earth. Shaft collapse kills two in Morocco mine. Asteroid 2018 LA impacts the Earth.